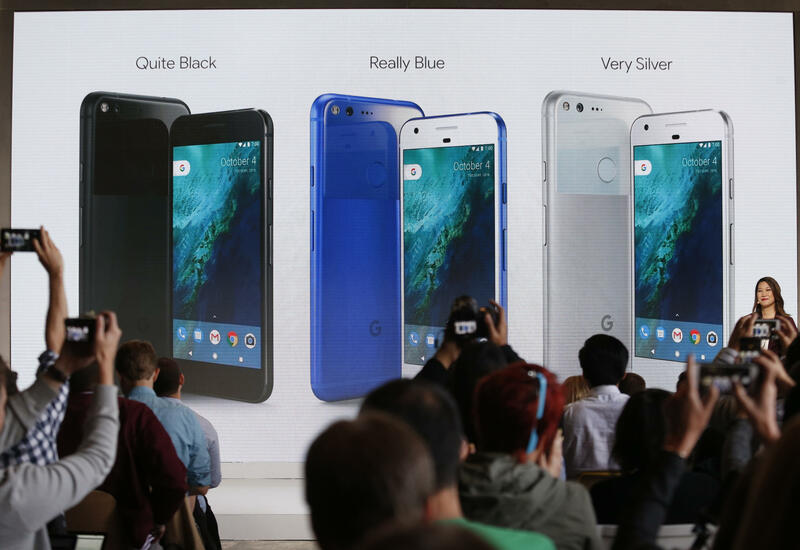 On Tuesday, Google unveiled Pixel, its newest smartphone and answer to Apple’s recent iPhone 7. Google aims to assert itself in the market as a strong smartphone competitor to Apple and Samsung by releasing a device that, among other features, has a highly touted camera with unlimited storage and runs with Google Assistant – the company’s version of Apple’s Siri. Google showed off the Pixel phone at a press event in San Francisco along with a number of other new devices, including the virtual reality Daydream View headset and Google Home, a Wi-Fi-enabled, voice-controlled device that uses Google Assistant to play music or answer questions. The Pixel phone – which the company calls “the first phone made by Google inside and out” – comes in two sizes, 5 inches (slightly larger than the iPhone 7) or 5.5 inches (same as the iPhone 7 Plus). The emphasis on the Google Assistant as a utility player that can connect multiple devices to stream music, play videos, and answer questions seems to position Google in direct competition with Apple’s strategy of releasing sleek, interconnected, Siri-enabled devices. In another dig, the Pixel phone comes with a headphone jack. The name Pixel had previously been used for Google’s tablets and Chromebook laptops, and will replace the company’s Nexus phone brand, CNET reports. Those phones have been on the market for the past six years and were aimed mainly at dedicated Android developers and consumers. CNET senior editor Scott Stein said with its latest products, Google is attempting to build a bridge between its past image as a search engine to its future as a tech company serving all aspects of daily life. “The bridge is in all the other stuff, and I think that Google has to explain why Google in the home, Google in your life, Google listening to you all the time -- whether that’s something that you want,” Stein told CBS News. One of the major selling points of the new phone is its 12.3-megapixel camera. The camera is embedded in the phone’s design, so it doesn’t have an “unsightly camera bump” as Osterloh said at the event, in an obvious swipe at the design of Apple’s newest phones. For photo-taking fans who constantly use up storage on their smartphones, the Pixel comes with free, unlimited photo and video storage courtesy of Google Photos. Among the camera’s many features is that it continuously shoots 30 frames per second. When a user hits the button, the camera captures up to “10 frames out of memory and combines them into a single shot,” writes CNET’s Stephen Shankland. The new phones come in three colors – “Quite Black,” “Very Silver,” and the limited-edition “Really Blue,” which drew loud applause from the audience. Pixel is available for pre-orders starting today at $649. Beyond the new Pixel phone, Google spent a lot of time introducing Daydream View, its new virtual reality headset. Plans for the device were first announced at Google I/O, the company’s annual developers conference, back in May. The Daydream View will be available in November priced at $79. The headset comes with a fabric cover and a controller, and is 30 percent lighter than most VR headsets, Google said. It will be released first in a gray called “Slate,” and then will later be offered in “Crimson” and “Snow” colors. Pretty cool. Daydream lets a phone pop in and auto align, connect. Stein said the price was an important selling point. “It’s kind of a stocking-stuffery thing, it could be fun. And certainly that’s the right price.... Paying hundreds and hundreds of dollars for VR that’s evolving fast – it’s an iffy proposition unless you’re that person, you want to spend that,” Stein told CBS News. If you want to view Pixel virtual reality content, you can just drop your phone into a pouch in the headset, which will auto-connect with the device. The Daydream headset will also be compatible with a number of other phone models, though not all. Stein stressed that the verdict is still out on whether virtual reality technology will catch on widely with consumers.